Finland is home to one of Europe’s most forward-thinking societies, so it should come as no surprise that esport is flourishing there. Professional gaming’s move into the mainstream has also spawned a vibrant betting scene. Let us show you which Finnish bookmakers offer the best value on the world’s biggest esports leagues and tournaments. 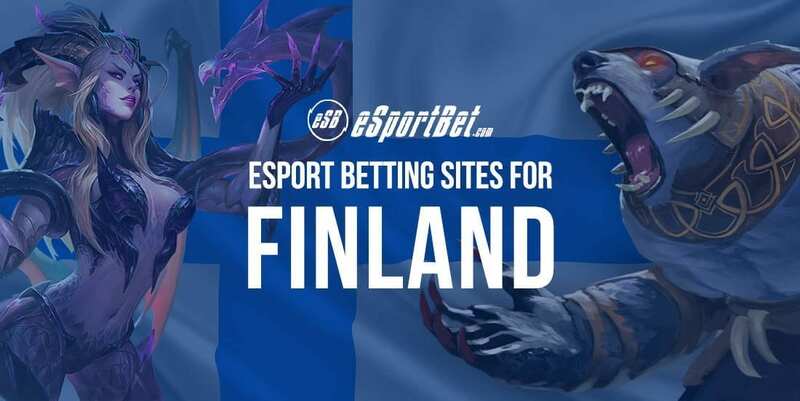 Finnish esports fans can choose from dozens of online bookmakers. We at eSportBet.com only recommend licensed betting sites that offer competitive odds, diverse markets and superior customer service. Arcanebet.com – Launched in 2017, Arcanebet belongs to a new breed of sports betting sites. It takes a special interest in emerging markets that are often overlooked at major bookmakers, which makes it a haven for esports gamblers. Pinnacle.com – Pinnacle was one of the very first online bookies to give esports the time of day. The Isle of Man firm is now a giant of the industry with hundreds of daily markets and futures for egaming leagues worldwide. BetOnline.ag – Based in Panama, BetOnline offers racing books, sports betting, online casino games and real money poker to gamblers all over the globe. That impressive repertoire includes a diverse and fast-growing esports scene. It has not taken long for Finland to welcome electronic sports into the mainstream. In 2017, the Finnish government amended the legal definition of ‘athlete’ to include professional gamers. This has legitimised the sport as a whole and granted players many of the same perks that footballers and F1 drivers enjoy, including an easy ride through mandatory military service. Is it legal to bet on esports in Finland? Finland might be considered a plucky underdog in the grand scheme of things, but it ranks among the top few nations in the world for gambling activity per capita. This is especially true of online gambling, which accounted for more than a third of the country’s gaming and wagering spend in 2017. Although Finland has legalised most popular forms of gambling, only three companies are permitted to operate gaming, wagering and lottery services within the nation’s borders. This monopoly system is designed to prevent commercial competition and protect Finnish gamblers from excessive advertising, unethical business practices and potential addiction. And the Slot Machine Association, which runs all slots and casino-style games. The Lotteries Act 2010 expressly forbids any other company from advertising or providing gambling services to Finnish residents. These laws only apply to operators, not gamblers, and are difficult to enforce upon offshore firms that hold online gambling licenses in other EU nations. What does that mean for esports betting in Finland? Given that thousands upon thousands of Finns continue to use online bookies for horse racing, football betting and other wagering services, we can safely say it is A-OK to bet on pro gaming over the web. The best esports bookies offer a number of secure, convenient banking methods for Euros, British pounds, US dollars and many more international currencies. Open the tabs below to find out which options are best for you. Credit cards and debit cards – This is the quickest and easiest way to fund your esports betting account. All reputable online bookies accept instant deposits with Visa and MasterCard products, while many sites also support fast withdrawals by card. Web wallets – These are ideal for gamblers who want to make instant payments online without sharing credit card numbers or bank account details. Popular e-wallets for bookmaker deposits include Neteller, Skrill and ecoPayz, all of which are free to join. Instant banking – Plenty of bookies give you the option to make on-the-spot transactions from your bank account without the need of credit cards, debit cards, or web wallets. Many Finnish betting sites support instant bank transfers via Citadel Direct. Prepaid cash vouchers – Some people prefer to keep a low profile on the web, which rules out the use of most online payment services. Hundreds of online gambling sites accept Paysafecard prepaid vouchers, which can be purchased at retailers all over Finland. Bank transfers – Most online bookmakers accept standard bank deposits and wire transfers upon request. Payments take a few business days to clear, but the lack of transaction limits makes this an ideal solution for high-stakes gamblers who want to transfer large amounts at a time.